Welcome to the General Music page. Here you will find information about the standard general/vocal music curriculum and also find information about what is happening in the music room. I hope that you find this site informational, and I hope this gives you a little peek into your child's music class. All students at Lisbon will receive 60 minutes of music per week. This section will give you general information about our music classes. Our standards have changed! This year Howard County Music will be working with a new curriculum based off of the new national standards. Please take a look at the new standards since classroom grades will be based off of these standards. In all general music classes, students earn a content grade as well as an effort grade. Students are graded based on the following. Content grades are based upon knowledge and execution of music concepts such as steady beat, tempo, rhythm, form, and pitch. Students are assessed using in class activities, singing games, informal assessments, and group/individual activities. Students receive letter grades A-E based on their understanding of musical concepts. Students are assessed using teacher created assessments which include listening maps, performance assessments, group activities, composing, online applications, and their ability to critically listen to and describe music using appropriate terms and vocabulary. It is important to understand that these iPads are covered under the media and information use policy for school technology, similar to computers. Student’s access to content will be carefully monitored, and acceptable use guidelines apply to this technology, as it does for any other piece of technology in the building. We will be using the iPads as an assessment tool, small group cooperative learning tool, a project based learning tool, and a composing tool. The possibilities are endless for integrating this technology into our music program. 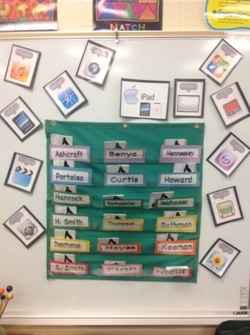 Throughout this year students will be using the iPads for some really fun and exciting activities. They will be using apps for music history, global culture networks, cooperative composing, apps for music flashcards, storyboarding, music theory, recorders, and film scoring, to name a few. I am very excited to have this opportunity and the PTA was very gracious to help us with this endeavor. I look forward to keeping you posted on future grant and fundraising opportunities, as well as the student’s progress and success.